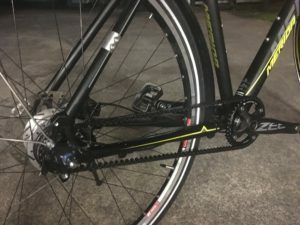 Are you looking for a Southside Brisbane bicycle mechanic? Do you find it hard to get to your local bike shop during opening hours? If so, you have come to the right place. Bike Knack offers a flexible, low-cost service from our Salisbury workshop, with pride in quality and attention to detail. After-hours drop-off and pick-up are also available on request. Dave is trade-qualified in the mechanical trades and has over 30 years’ experience servicing bicycles. He is passionate about cycling and has a personal history of competing in road and MTB events across his life. He knows the importance of a well-chosen and maintained bicycle and the pleasure of testing your body on a hill, sprint, or technical trail. Perhaps you’re not sure what you need done? If so, we are happy to provide advice and quotes over the phone or by email. Standard labour prices are also available via our Pricing Table. Perhaps you bought parts on the Internet but found you couldn’t install them yourself? We willingly provide labour for that. 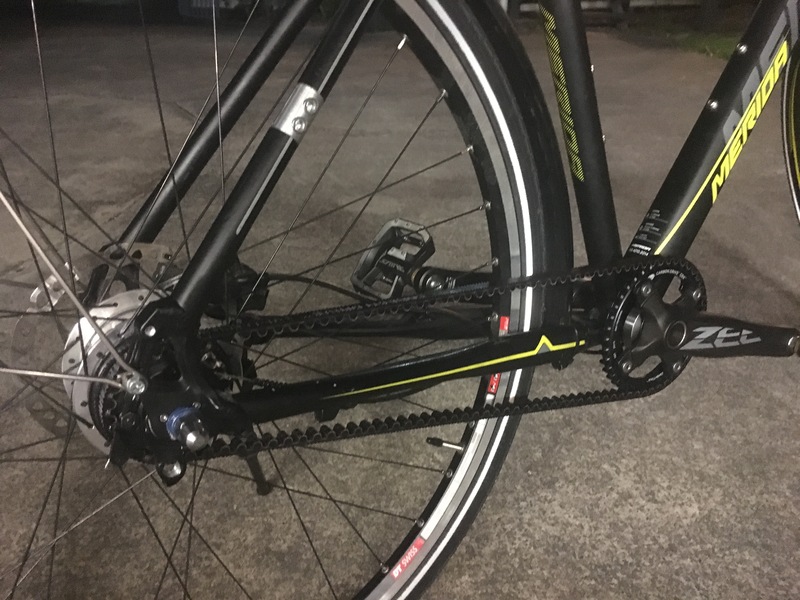 For those with an interest in belt drive, Bike Knack offers a frame conversion service for Gates Carbon Drive. 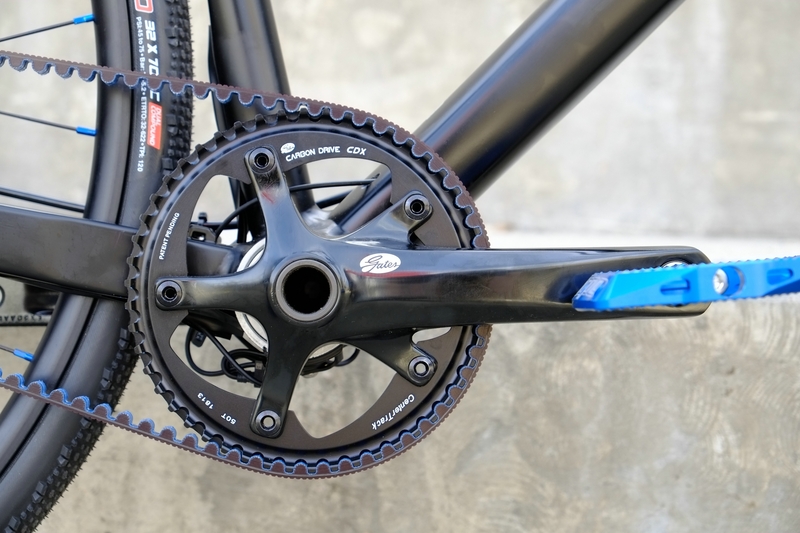 The Gates system is compatible with either a single-speed setup or internal gearing. We can assist you in choosing the best option for your riding style. We also provide after-market E-bike conversion for commuter or touring bikes. For those who may be thinking of riding to work or taking a cycling holiday, converting your current bike to electric can be an attractive option. If you need to box up a bike for a trip or learn how to reassemble it after you arrive, we can help with that too. If you have a question, Dave can be reached on 0437 017022 or via email. Gates Carbon Drive belt drive bicycles require a specialized frame. Unlike with a chain, it is not possible to open and rejoin a belt around the chain stay for installation. Instead, to install a belt you need to open the frame itself. While some bike manufacturers make frames for Gates belt drive, the available range is still fairly small. But if you don’t want to buy a specialty frame, another option is belt drive conversion of an existing frame. Some road or hardtail mountain bike frames can be altered to allow Gates belt installation. For frame modification, you can remove a section of the seat stay and replace it with a custom splitter matched to the seat stay diameter. A frame jig is essential to stabilize the frame during cutting and installation of the splitter. Once the splitter is in place, installation of the front and rear cogs and belt installation and tensioning can proceed. 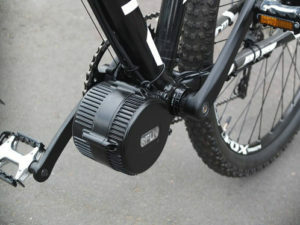 Bike Knack offers conversion of frames for Gates belt drive by installation of custom-made splitters. Frame materials can be steel, alloy, titanium or carbon. 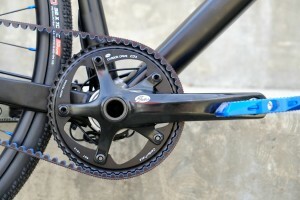 Both internally geared hubs and single-speed systems are suitable. 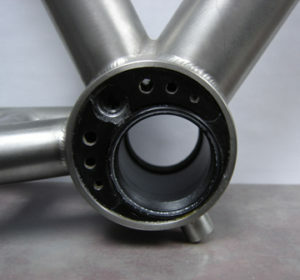 However, the frame will need a sliding rear dropout or eccentric bottom bracket to allow belt tensioning. Unfortunately, not all bike frames are suitable for this method of belt drive conversion. For example, ovalized or very highly tapered seat stays are unsuitable. 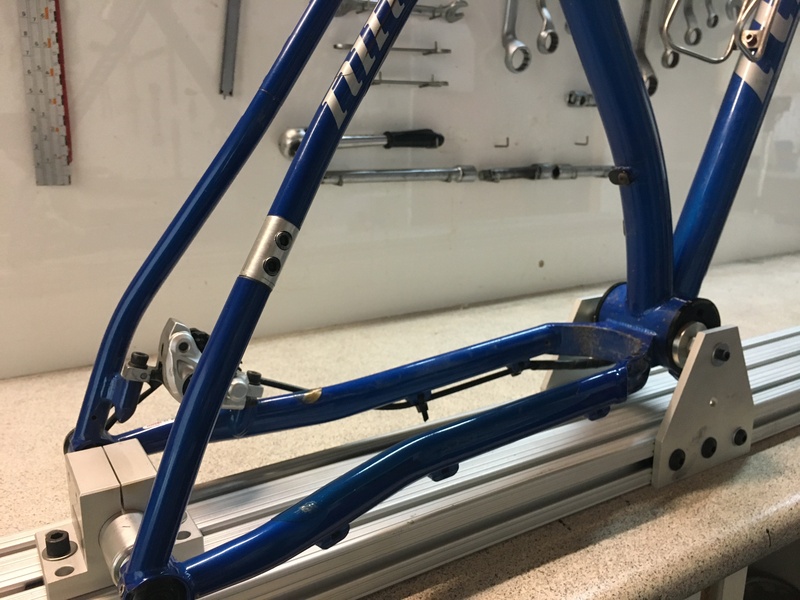 If you would like to confirm the suitability of your frame, you can email us or phone Dave on 0437 017022. 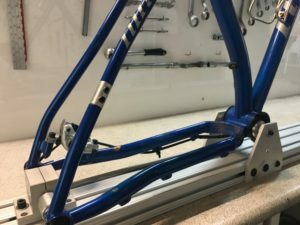 Our standard price for frame conversion is $250, much lower than typically charged by frame builders. Shipping costs within Australia will vary with frame size and weight, but can be calculated here. If you already own a suitable frame, frame splitting can offer a price-competitive entry point to belt drive use. We can also supply your choice of belt and front and rear sprockets: a full range of Gates products is available in our Shop. Electric bikes have become increasingly popular in recent years. For those who ride to work, an E-bike means hills or distance are less of a barrier. Or if you enjoy touring, a pedal-assisted bike may let you travel further and carry more. There is a growing range of ride-ready E-bikes available. But if you have a bicycle you already enjoy riding, another option is E-bike conversion. 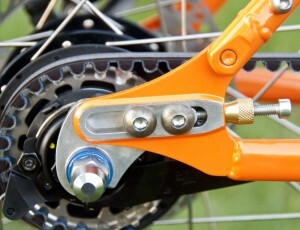 Bike Knack now offers after-market conversion at reasonable pricing. Customers can bring their own kits, or we can source one for you from local suppliers. Pedal-assisted electric bicycles come in several basic formats. One class of E-bike has a motor in either the rear or front wheel (or rarely, both). E-bike conversion to this system means buying a new wheel and throwing out an existing one. Another class of electric bike are mid-drive E-bikes. Here, the motor connects to the bottom bracket. This set-up makes better use of existing parts, as you keep both your current wheels. Apart from the motor position, E-bikes also vary in the battery site. With wheel drive, the battery may be on a rear carrier. However, it can also be in the triangle. Mid-drive bikes tend to place the battery here too, where a bottle cage normally sits. If you are thinking of converting to a pedal-assisted bike, you need to choose the motor power. More power means more help on hills, but also shorter battery life. Power levels are commonly 250 or 350 watts. E-bike conversion kits at this power cost around $1000-$1500 depending on the battery and other accessories. Higher power is available, but usually isn’t necessary. E-bikes generally have a top assisted speed of 25 kph. You can roll down a hill faster than this, but the motor won’t contribute to the added speed. Motor output can also be adjusted using a controller on the handlebars. ­Successful E-bike conversion means mounting the motor correctly for smooth power transfer. The battery needs to be held securely in place and the cable routing shouldn’t interfere with handling. The controller should also be easy to use while riding. 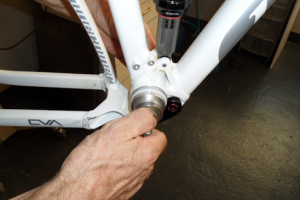 Bike Knack offers a high-quality conversion service for suitable bicycles. Our standard labour cost of $300, although this may vary depending on the complexity of the installation. To discuss your conversion, contact Dave on 0437 017022 or by email. At Bike Knack, we don’t believe in charging for unnecessary work. We offer a basic and full service for bicycles as listed below. However, we find the vast majority of our clients want a specific task carried out. It might be spoke replacement, a brake bleed or anything up to full rebuilds. Alternately, you may need us to find why your bike is creaking or your gears aren’t changing properly. We are happy to diagnose problems and carry out work to your requirements. If you are uncertain what needs doing, we will give you a professional opinion and let you make the call: there are no hard sells here. The services below are just an indication of the work we can undertake. Dave is a trade-qualified fitter and turner, not just a bike mechanic, so can carry out unusual jobs like bob trailer modification or adult tricycle repair. Feel free to ask if there is something specific you want done. Prices listed are for labour only. If parts are required, customers are welcome to supply their own, or we can source components for you at or below market prices. Dave can be contacted on 0437 017022 or by email to book a service or discuss any work not listed here.